FML is a free online resource for music loops and drum samples, showcasing the loops and samples available from our sponsor websites, Proloops, Beatbasics & Music Loops. 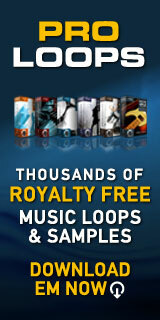 We have hundreds of royalty free music samples you can download completely free including drum loops, bass loops, keyboard loops, guitar loops and a number of single hit percussion and drum samples available for instant download. 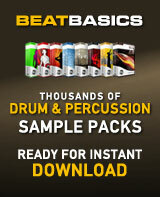 110 LoFi drum kit loops in various time signatures and grooves. Swung, indie, straight, grunge, 6/8, 12/8 and 4/4. Real, grungy and with lots of character. 101 Electric guitar 'song builder' loops in the style of legendary Police guitarist Andy Summers. This song builder style pack features crunchy rhythm comps, clean strums and arpeggios. 121 loop collection of banging 'mid fi' acoustic drum samples and more 'garage band style' gritty acoustic drum loops from a selection of Proloops sessions. 70 funk / disco style drum samples. This great value download pack contains snares drums, low mid and high tom toms, kick drums, multiple hi hat and cymbal variants to help you create realistic drum parts. 72 skate punk / power pop style kit samples. This great value download pack contains snares drums, low mid and high tom toms, kick drums, multiple hi hat and cymbal variants to help you create realistic drum parts. 72 dirty industrial FX drum samples. This great value download pack contains snares drums, low mid and high tom toms, kick drums, multiple hi hat and cymbal variants to help you create realistic drum parts.